Explanation: Windows Vista, Windows 7 and Windows 8 were designed to support SHA-1 digital certificates. Starting Windows 8.1 Microsoft requires kernel-mode drivers to be signed with SHA-256 digital certificates and, therefore, all recent APSoft drivers are signed with SHA-256 Code signing certificate. 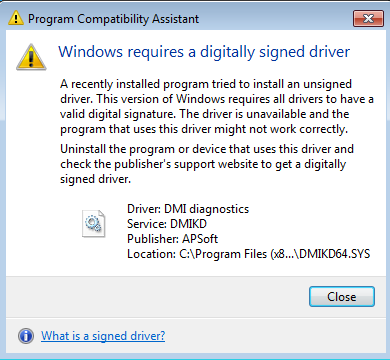 Windows 7 x64 and Windows Vista x64 will not load such drivers, however in file properties (Digital properties) you can see that driver is signed. This issue occurs because the buffer that is provided by the GetCertHash() function is not big enough to store a hash value that is 256-bits (32-bytes) or larger. To resolve this issue, install the following update on the computer. After you install the update, the GetVertHash() function can store hash values that are 512-bits (64-bytes) or smaller. Exe/dll files will be signed and loaded correctly (for example for UAC dialogs). For Windows 7 (SP1) and Server 2008 R2 (SP1), please refer to Microsoft Knowledge Base Article 3033929. Corresponding download is available here. (the article "Availability of SHA-2 Code Signing Support for Windows 7 and Windows Server 2008 R2"). For Windows Vista and Server 2008, please refer to Microsoft Knowledge Base Article 2763674. You can download corresponding update package from this page.